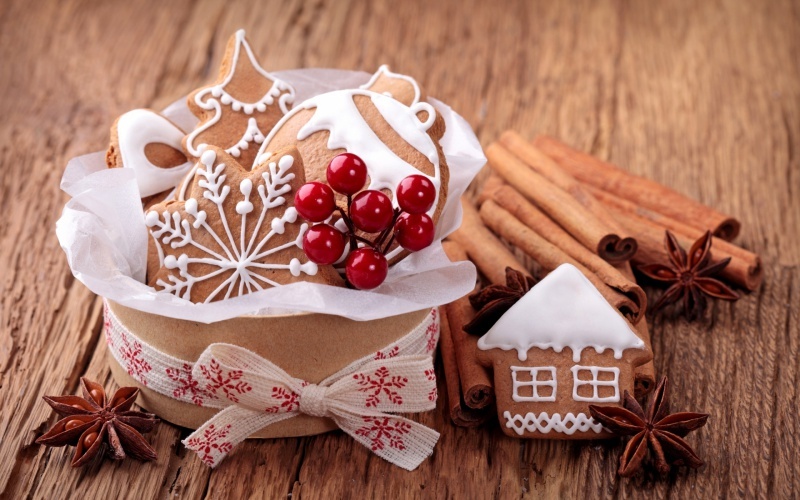 Home > Food & Recipes > Use these 8 fragrant Christmas spices! Christmas holidays are ideal for enjoying the intoxicating scents of herbs. The following are 8 herbs and the ways in which they can be utilized. Cinnamon definitely deserves to be in first place, most often found in baked goods, cakes, apple juice, hot drinks, even as a function of decoration. In addition to these popular uses, cinnamon is useful to relieve indigestion and nausea. For tea, cinnamon, cook 3 to 4 sticks in two cups of water and, if desired, sweeten with honey. Small, pointed, hard bits that we use in the kitchen are actually the dried buds of the clove plant. Clove-flavored usually the outer surface of the meat, cakes and mulled wine. You can throw in a glass of mulled wine or tea for flavor and decorative expression. Chewing cloves is used to remove bad breath. Nutmeg is another favorite spice that is often used in cakes and pies. It has properties that help regulate digestion. To settle your stomach, add a pinch of nutmeg in a cup of ginger tea. Use nutmeg in small doses, otherwise it can be toxic. A glass of warm milk with nutmeg sprinkled relax before bedtime. Best placed troubled children who can not sleep. One whole nutmeg is the equivalent of 2 to 3 tsp nutmeg powder. Ginger has a specific aroma and numerous medicinal properties such as increasing blood circulation, reduce inflammation, nausea, gas, and fever. Tea ginger pour cup of boiling water over 2 teaspoons grated fresh ginger root. Leave on for about 10 minutes, then strain. If desired, add a little honey and lemon. Rosemary is a delicious herb that is often used for roasts, soups and stews. There are many health benefits such as hair and skin rejuvenation, reducing headaches, and acts as a mild diuretic. Rosemary is great with fried chicken or glazed ham. Shine, try it, rinse with fresh water with rosemary. In addition to health benefits, rosemary can be extremely decorative bouquet or decoration for the Christmas tree. Sage for thousands of years greater healing plants. Anti-inflammatory and relieves irritation of the intestines and stomach. It also has a positive effect on sore throat and concentration. Sage make tea and sweeten it with some honey. Mint is especially useful during the holiday season because it stimulates digestion and relieves heartburn. After dinner, sip mint tea in order to facilitate the absorption of food. Peppermint relieves headaches, so rub a few drops of lavender oil on the temples to relieve symptoms. Essential oil mix with base oil, for example. olive or almond, to avoid excessive reactions in sensitive skin. Astragalus can be consumed as a tea, a tincture, or in the form of capsules. Chop the dried root and insert in soups and stews. Astragalus strengthens the immune system and thereby reduces the frequency and duration of the common cold and flu. Next: Try these healthy snacks! 5 summer drinks for slimmer waist: Drink them without compunction!